Here are some details that will help you get the best results from your fudge-making efforts. You can click on a question to jump directly to a topic, or read all the topics below. How do I make a double batch of dairy-free fudge? Can I cook the fudge on the stove top, instead of using a microwave? What types of milk work best? What types of oil work best? Can I use a mixer, instead of stirring by hand? Why is it important to scrape the bowl between cooking sessions? How do I avoid "gritty" fudge? What types of microwavable bowls work best? What's the best way to store the fudge after it's made? How do I know when to pour the fudge to get the best result? For variety, what other flavors could I add to my dairy-free fudge? What if I'm a vegan? What if I have food allergies or intoleratnces (other than dairy)? Doubling the Chocolate Fudge recipe that does NOT have marshmallow is difficult. Whether cooking in microwave or on stove top, batches turn out unpredictably. It takes approximately 20 minutes to make a SINGLE batch of microwave fudge, and when trying to cook a double batch of this recipe, it took 30+ minutes to make, and I never really got a good result (too soft-twice, too hard-once, and never got a good creamy batch). If you're going to all that work, I'm sure you'd like the fudge to turn out, so I suggest making two single batches (microwave), just remembering to wash off the bowl and cooking spoons/spatulas between batches. For the Chocolate Fudge with Marshmallow and the Peanut Butter Fudge, making a double batch in the microwave is difficult. Stirring is long and the product is unpredictable. I don't recommend it, but you can try it. Use a 2 liter bowl or larger (to prevent boil-over), double all ingredients (except milk, reduce by 1 Tablespoon), and cook until fudge reaches 225 degrees (don't forget to scrape down the sides of the bowl at some point during cooking with rubber spatula). Add marshmallow and vanilla (or peanut butter for the PB Fudge) and stir (I'd use an electric mixer, ON LOW SPEED to avoid splashing). 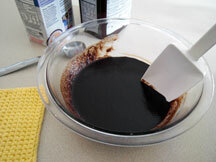 You may need to stir as long as 10 minutes (hence the need for the mixer), then pour onto wax paper. Combine cocoa and oil in 2.5 Quart or larger stainless steel or aluminum saucepan (can't use beaters in a non-stick saucepan). Add the rest of ingredients. Over SLIGHTLY higher than MEDIUM heat, cook fudge, stirring often, until it reaches 230 degrees on a candy thermometer. Remove from heat and add marshmallow and vanilla. Because stirring fudge can take up to 10 minutes until its ready to pour, I suggest using an electric mixer to stir (on LOW speed, to avoid splashing; don't use higher speeds, or you'll end up with frosting!). Also, to speed cooling, you can use a cool water bath for sauce pan: In a METAL dish (round, square, or 9x13 cake pans work), fill pan half-way with water and set pan in water - this cools the fudge quicker...less stirring! (NEVER use this cooling method with a glass bowl because, as in microwaving, the glass could break!) When fudge looks close to pouring (fudge gets VERY thick), add nuts, if desired. Pour when ready on wax paper and cool. Combine all ingredients, except peanut butter, in 2.5 Quart or larger stainless steel or aluminum saucepan (can't use beaters in a non-stick saucepan). Over SLIGHTLY higher than MEDIUM heat, cook fudge, stirring often, until it reaches 230 degrees on a candy thermometer. Remove from heat and add peanut butter. Because stirring fudge can take up to 10 minutes until its ready to pour, I suggest using an electric mixer to stir (on LOW speed to avoid splashing; don't use higher speeds, or you'll end up with frosting!). Also, to speed cooling, you can use a cool water bath for sauce pan: In METAL dish (round, square, or 9x13 cake pans work), fill pan half-way with water and set pan in water - this cools the fudge quicker..less stirring! (NEVER use this cooking method with glass bowl because, as in microwaving, the glass could break!). When fudge is ready to spoon onto wax paper and cool. 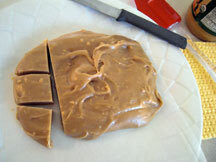 If you're someone who doesn't like using a microwave to cook, you can get a "decent" fudge using the stove top method. You can make this fudge on the stove. The batches I made this way varied in quality from soft to hard. I used a candy thermometer to figure out when the fudge was "done" cooking and found that having the fudge reach 225 degrees Fahrenheit seemed to produce a "firm" fudge (flaked when you cut it) and 220 degrees was a little soft (think of firm peanut butter). These batches were "edible" but not the "perfect" fudge. I made a regular batch and double batch on the stove top and stirring took longer (see Using a Mixer below), but you CAN make this fudge in a saucepan. When making the marshmallow fudge, I suggest you cook the fudge to 225 degrees, remove the fudge from heat, add vanilla and 1/4 cup marshmallow "fluff" and stir until ready to pour. This should produce an "easier to cut" fudge. I tried using a non-stick saucepan and a stainless steel pan, and neither batch scorched with intermittent stirring while cooking. If you use an electric mixer, be sure your saucepan is stainless steel or aluminum. Don't use beaters in a non-stick saucepan. I have used Rice Milk, Almond Milk, Soy Milk and even Coconut Milk to make this recipe, and I didn't notice any difference in flavor...except from the Coconut Milk which added a Coconut flavor...no surprise! Every cooking oil has a "flavor" to it. I started making fudge with canola, but found a slight aftertaste. I tried corn oil and LOVED IT, very mild -- no aftertaste. BUT, when I bought my third bottle of corn oil (same brand as always), it was horrible and had an aftertaste so strong that I threw out the batch of fudge. Then I remembered the first time I tried canola oil (10+ years ago). It was awful, but several years later, I tried it again and liked it. So my conclusion is this: the flavor of oil varies from bottle to bottle regardless of same type and same brand. If you think about it, when you buy red grapes, some will be tart and some sweet. So the flavor of an oil will depend on the flavor of its corn or olives with each batch of oil varying. Having said that, I still prefer corn oil for the fudge, but canola is my second choice. Sunflower oil has a nutty flavor and light olive oil is good, too. BUT, it's up to YOUR palate to decide what oil tastes best to you. Initially when the fudge is very liquid, it can splatter (fudge is HOT!!!). Once fudge cools and thickens a bit, splatter is not a big problem, but be careful just the same. Mixing at higher speeds can lead to a result that is more like frosting than fudge. When fudge begins getting firm and close to pouring, trade your beaters for a spatula so that you can easily scrape the fudge from the bowl. If you use an electric mixer with the stove-top method, be sure your saucepan is stainless steel or aluminum. Don't use beaters in a non-stick saucepan. It is essential that you scrape down the sides of the bowl between the 3 minute cooking sessions because of sugar "chemistry." If unmelted sugar particles are introduced into the fudge during the stirring/cooling process, those sugar particles cause a "chemical" chain reaction in the fudge that my mom used to call "sugaring." If your fudge "sugars," it will be "crunchy" or "gritty." So after your first 3 minute session of cooking in the microwave, stir the fudge and then do your best to scrape down the sides of the bowl before continuing cooking. It's worth the effort. 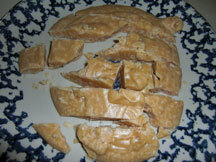 An example of "sugared" peanut butter fudge appears in the photo below. Another reason for gritty, "sugary" fudge is allowing the liquid fudge to sit without stirring for a period of 15 seconds or more. If you let it sit too long without stirring, the resulting fudge can be gritty. Using a tempered glass bowl is RECOMMENDED. Some crockery bowls are made for baking (which would withstand high heat) and some bowls are labeled "microwave safe," but does that mean they're okay for reheating green beans or that they can withstand 225 degree temperatures? I'd play it safe and use a tempered glass like, Pyrex, Anchor Hocking, etc. Also, this is just a preference, but the Pyrex bowl I use, has a "lip" (or protruding rim) on the edge which stays cool enough that I can pick up the bowl without using hot pads. (Using hot pads is fine, but with a smooth bowl without a lip, using cloth hot pads is a little "slippery"...and you do not want to drop a hot bowl of molten fudge!) My fudge demonstration pictures show a picture of the bowl with a "lip" on the edge if you're not clear what a "lip" is. I have even used a deep, 2 quart Pyrex casserole dish, which worked alright. If you'll eat the fudge within a week, you can store it at room temperature, but you may want it in the fridge after that. How you store it can depend on how your fudge has turned out. A "normal" batch of fudge can be stored in an airtight container. If your fudge has turned out a bit soft, store in a lightly covered container (with lid ajar or covered with paper towel, so it can dry a bit), and storing in the fridge will firm it some. A hard batch of fudge should soften up if you store it in an airtight container at room temperature. If you have no experience making fudge, knowing when the fudge is ready to pour is something you learn as you go. "Why" you need to stir fudge is to cool it and to blend the ingredients to give it its creamy consistency (if you didn't stir it, it would be a hard, gritty mess). 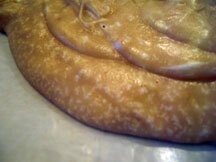 This fudge starts out pretty thin, but will become syrupy pretty quickly. The fudge will then become like frosting or pudding-like and may seem thick enough to pour, but if its still looks glossy, it's probably not ready yet. I've been making fudge for 30+ years and having a batch too soft/too hard is not uncommon. When making a cake or cookies, you can pretty much expect a perfect result, but fudge is a little tricky, so don't give up if you don't get "perfect" fudge every time (especially at first). Here are some ideas for adding a little variety to your dairy-free fudge making. Make a chocolate fudge batch according to recipe, but add a few drops of peppermint flavoring instead of vanilla and/or add a crushed peppermint stick to the fudge when it's close to being ready to pour. Using a chocolate fudge recipe, make as directed except add one level tablespoon of instant coffee after cooking. Adding a quarter cup of raisins and a quarter cup of chopped walnuts is a nice variation. Add nuts and raisins when fudge is close to being ready to pour. In the peanut butter fudge recipe, use almond butter instead of peanut butter, and add a few drops of almond extract. Using the chocolate fudge with marshmallow recipe, omit the cocoa and cook as directed. When finished cooking, add 30 mini-marshmallows or 1/4 cup marshmallow creme and 3/4 teaspoon maple extract, and stir as usual. When fudge is close to being ready to pour, add 1/3 cup chopped walnuts. You can add any extract flavor you think you may enjoy. I have tried coconut, peppermint, and orange flavoring. I imagine rum flavoring might be good, combined with raisins and nuts, it might be an interesting fudge flavor...I'll have to try that one! The peanut butter fudge recipe and the chocolate fudge without marshmallow recipe are vegan recipes. They do make vegan marshmallows, so if you have some, you can try them in the chocolate fudge with marshmallow recipe. The peanut butter fudge and the chocolate fudge without marshmallow are vegetarian recipes. The chocolate fudge with marshmallow recipe can be made with marshmallow creme (from a jar), which contains egg whites but not gelatin; therefore, it would be a vegetarian recipe using the marshmallow creme. Here are a few food-allergy/intolerance considerations for these fudge recipes. Technically, these fudge recipes are gluten-free. There is some controversy among wheat-intolerant people about whether hybrid corn might contain wheat aspects. If you think you will have no problem with corn oil, use it, but canola oil works fine. Marshmallows and marshmallow creme contain corn syrup, so it's up to you whether you make the non-marshmallow chocolate fudge or the chocolate fudge with marshmallow. FYI - According to Amazon.com, Rice Dream rice milk "contains gluten from barley protein at less than .002%." The peanut butter fudge and the cholocate fudge without marshmallow can be made using canola oil (or other oil) rather than corn oil. The cholocate fudge with marshmallow contains corn syrup in the marshmallows (or marshmallow creme). All recipes here are free of milk...hence this web site!